Way back in mid seventies of the last century, Dipti Mohanty came to Banaras. During these decades he depicted the eternal image of the City of Light, the architectural beauty and the structural complexity of ghats, in numerous fashions. For him this is symbolic of a spiritual harmony that revolves around this ancient space. 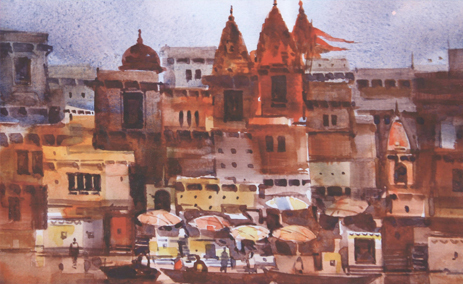 He enjoyed depicting the ghats, temples and river Ganga in many moods. There are views of capturing the mist of a winter morning, bright mid-day contrast, dark late evenings and the fascinating blues of the evening. Many of his paintings are interlinked yet in terms of details each one of them has a story of its own, subtle and elusive. Dipti's gouaches and acrylics have a distinct painterly treatment; they are evocative in terms of the treatment of chiaroscuro in a wide range of hues. An initial drawing in pencil or charcoal was developed with great care, transparent shades of brown and indigo added to define all the geometry of sacred edifices. Touches of bright primaries complete the symphony of tonalities that are invariably complementing the cardinal shades. Some of his etchings and aquatints follow the tonal structure and the magical somber depths of his paintings. They also shared the fine linear details and a concern for textural fields, so unique about his paintings. His rural landscapes done in transparent and opaque watercolors open the other half of his creativity. These are the memories of his village, a land of lush vegetation and mud houses midst undulating expanse of the earth. Spontaneously laid washes of color blend into each other while crisp strokes build up the particular forms. In contrast to his Banaras series these fluid depictions are about a pastoral poetry, essentially romantic and picturesque.